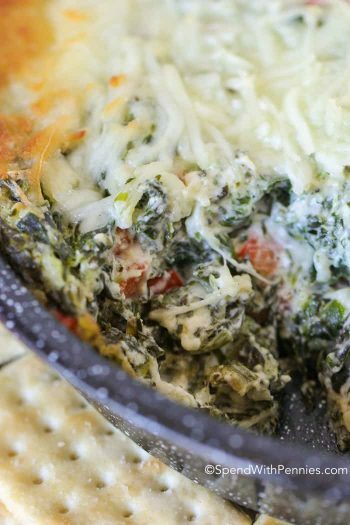 This rich and creamy Hot Spinach and Artichoke Dip recipe is easy, delicious and totally cheesy! 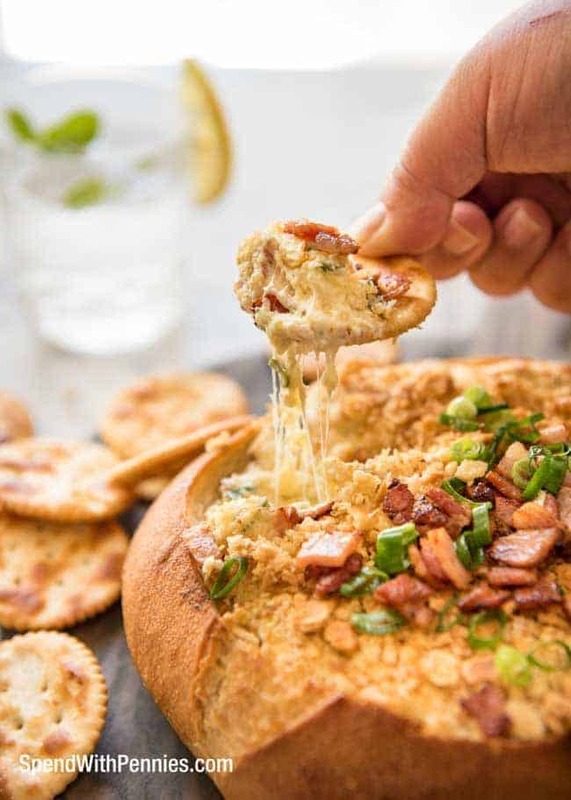 Once mixed, this dip is baked until warm and melty in a bread bowl for the perfect football game appetizer. 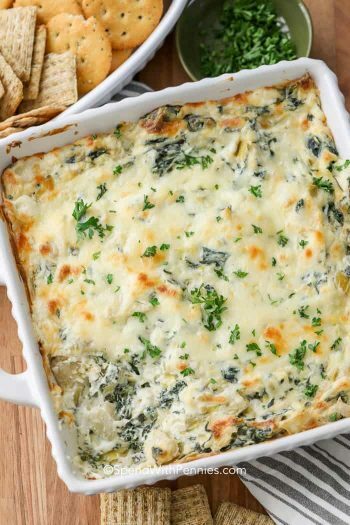 I love spinach and artichoke dip! For as long as I can remember, it’s always been one of my go to dips either hot or cold. 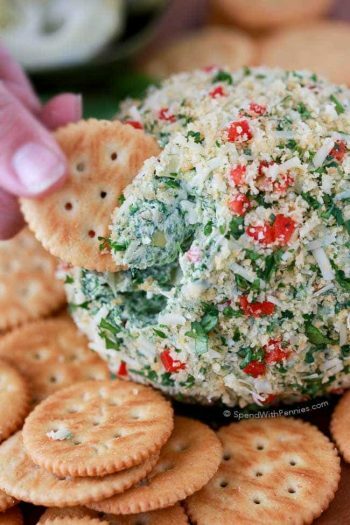 I’ve served Spinach and Artichoke dip cold as a dip or as a Spinach Artichoke Cheese Ball, or even a Spinach Artichoke Dip Pasta Salad (yes, it’s a thing… ). 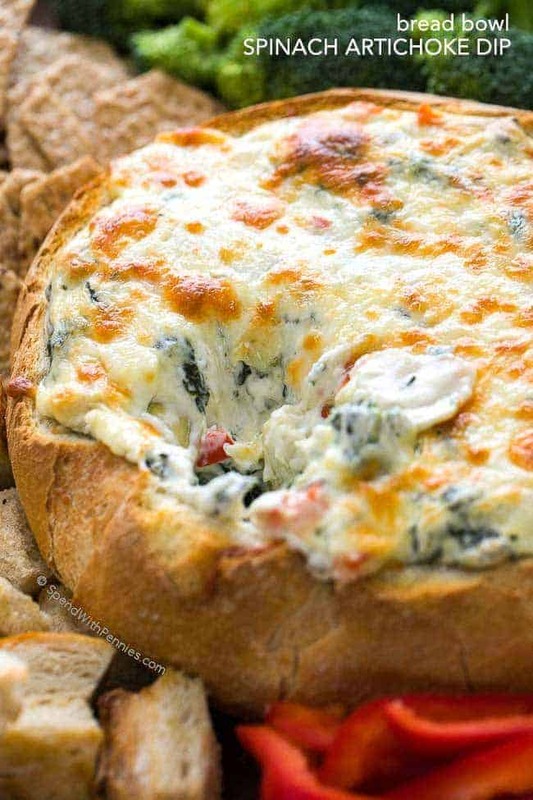 And of course we’ve all had a warm spinach dip of some sort. A rich cheesy base loaded with spinach and marinated chopped artichokes and then baked until everything is warm and melty. There are very few things better than digging into this warm gooey bowl and scooping up a mouthful on a piece of garlic toasted bread. 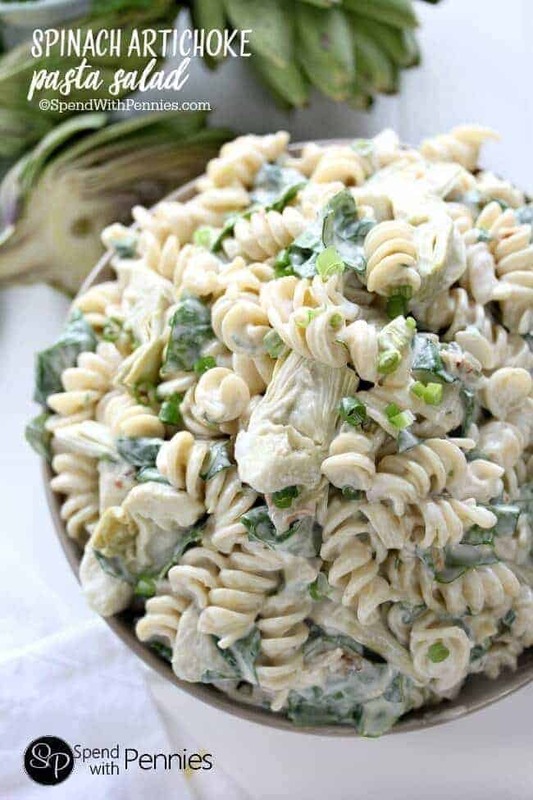 This recipe calls for marinated artichoke hearts. Marinated artichoke hearts are generally packed in jars (not cans) with oil and seasonings (while the canned artichokes are packed in water). As you would expect, the marinated artichokes in jars have much more flavor because of the olive oil and seasonings. 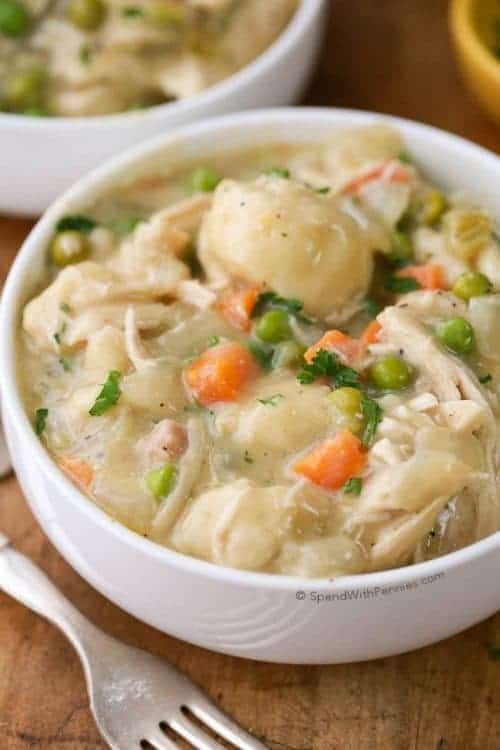 If you substitute canned artichokes in this recipe, it will still be delicious but you’ll want to make sure you add a little bit of extra salt, pepper and seasonings (your favorite spices such as Italian seasoning) along with small splash of olive oil. 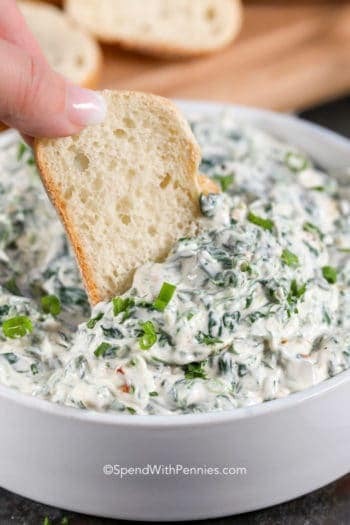 You can most certainly mix the cream cheese, sour cream and mayo by hand but over the years I’ve learned that using a mixer really makes dips light and fluffy. 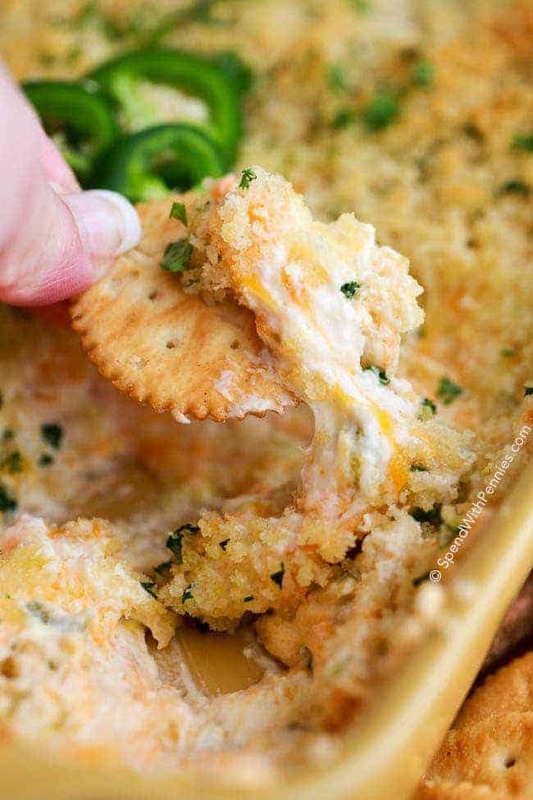 Once all of the ingredients are mixed together, this dip is microwaved for a few minutes to heat it. This cuts down on baking time and lets the center get hot without burning the bread (or making it too hard and crunchy). 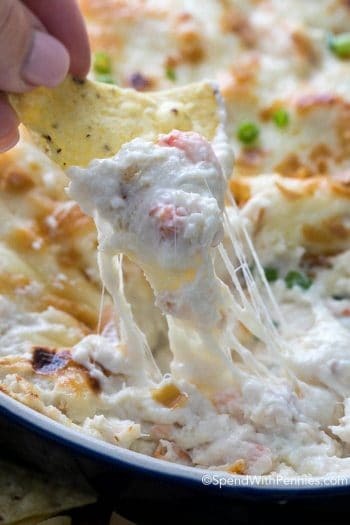 If you’d like to cook it without microwaving, skip the cheese topping and bake it covered for 15-20 minutes. Uncover, top with remaining cheese and bake as directed (and additional 25-30 minutes). 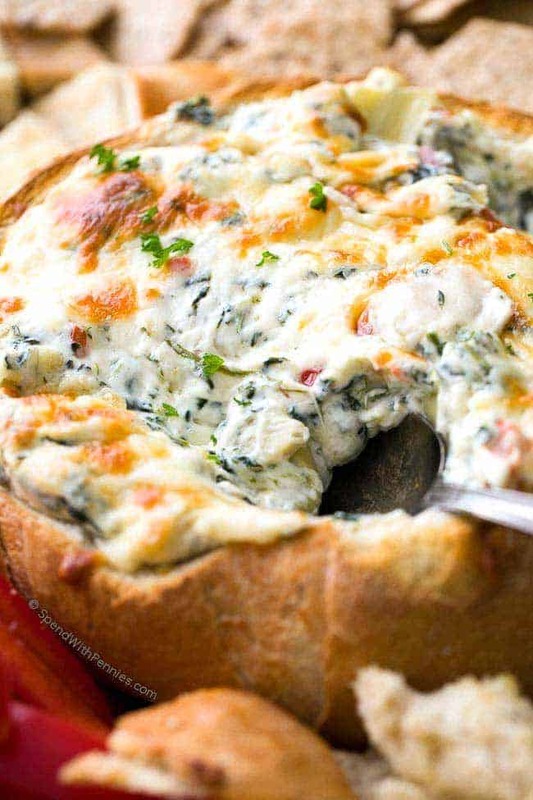 If you don’t want to cook this recipe in a bread bowl, a 2qt baking dish works just fine! 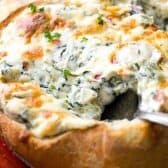 (I do have to say though, the bread bowl is crazy good and you’ll likely have to arm wrestle someone for it once it’s empty)! 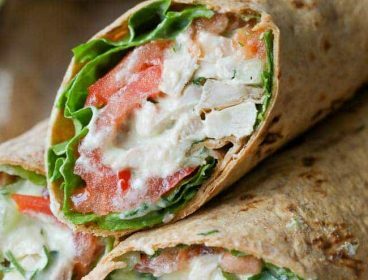 Depending on the size of your loaf of bread, you might have a little bit of extra dip. 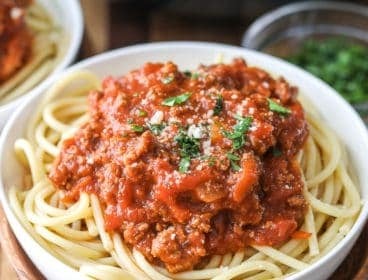 If you do, you can heat it in the microwave and refill the bowl as your guests dig into it or cook it in a small dish (it won’t take very long to cook). Cut the top off the sourdough loaf and remove the center leaving a 3/4″ shell. 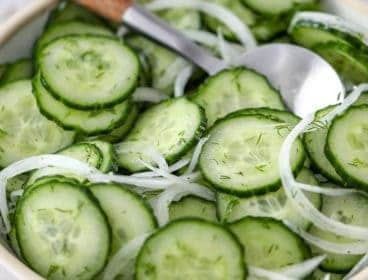 Cut the top and the insides of loaf into bite sized squares for dipping. 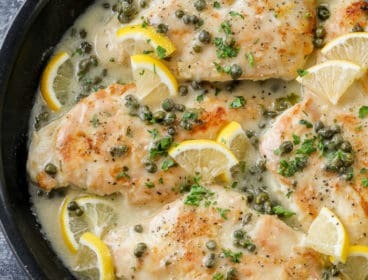 Drizzle with olive oil and garlic salt to taste. Bake 5 minutes. 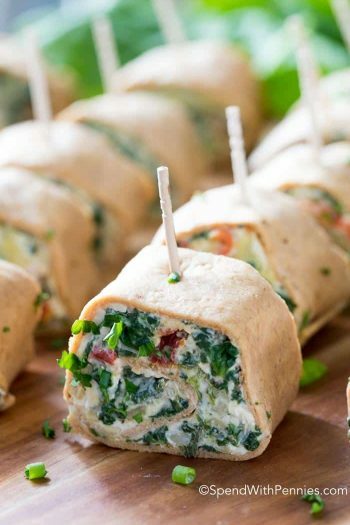 Squeeze as much liquid out of the spinach as you can. Set aside. 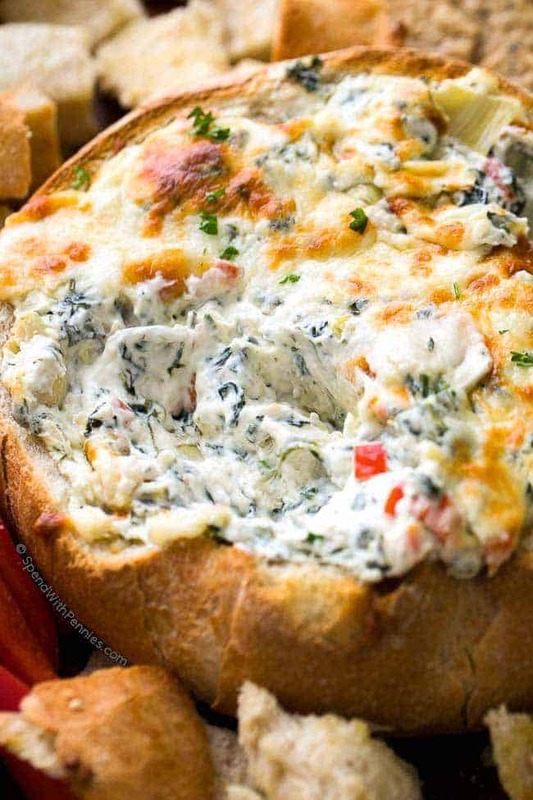 Beat cream cheese, sour cream and mayonnaise with a mixer on medium until fluffy. 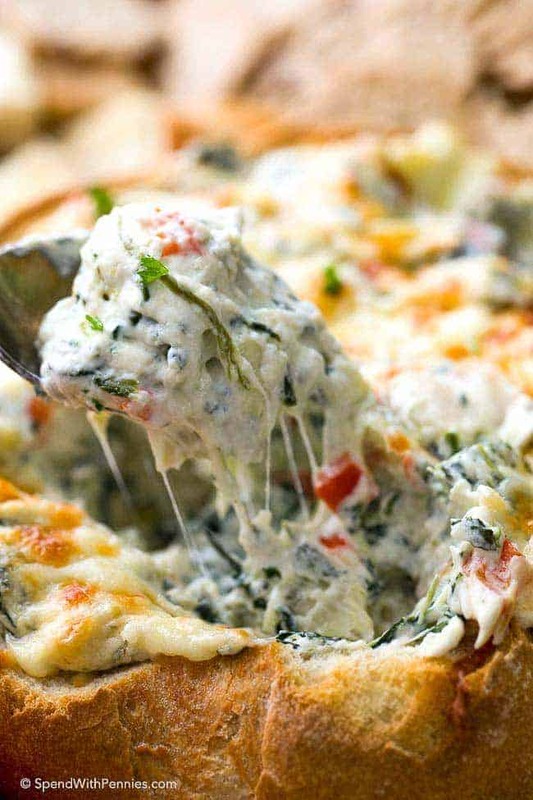 With a spoon, stir in garlic, spinach, artichokes, red pepper, parmesan cheese and 1 cup of mozzarella cheese. 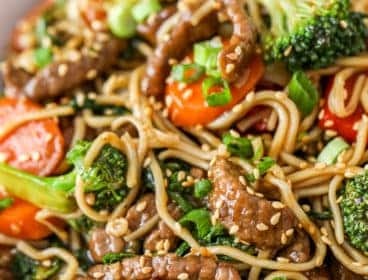 Once combined, microwave for 5 minutes stirring after 3 minutes. 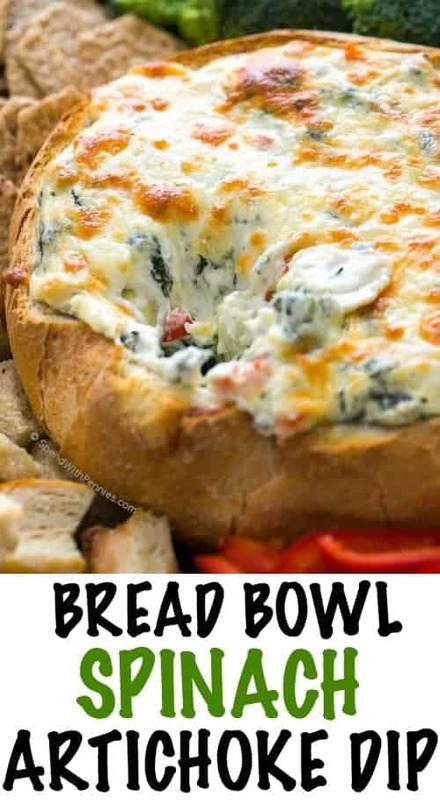 Place cheese mixture into the bread bowl. 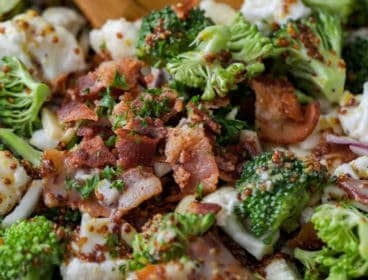 Top with remaining 1/2 cup mozzarella. Bake uncovered 25-30 minutes or until cheese is melted and center is hot.